It all started in 1960. On February 1, four black college students sat at the lunch counter of a Woolworth’s store in North Carolina, “where the official policy was to refuse service to anyone but whites,” explains history.com. They weren’t served, of course. But their sit-in sparked a movement. Thanks to national TV coverage, segregation foes showed their support by picketing Woolworth stores around the country. That included stores in New York City. Segregation was not legal here, of course. 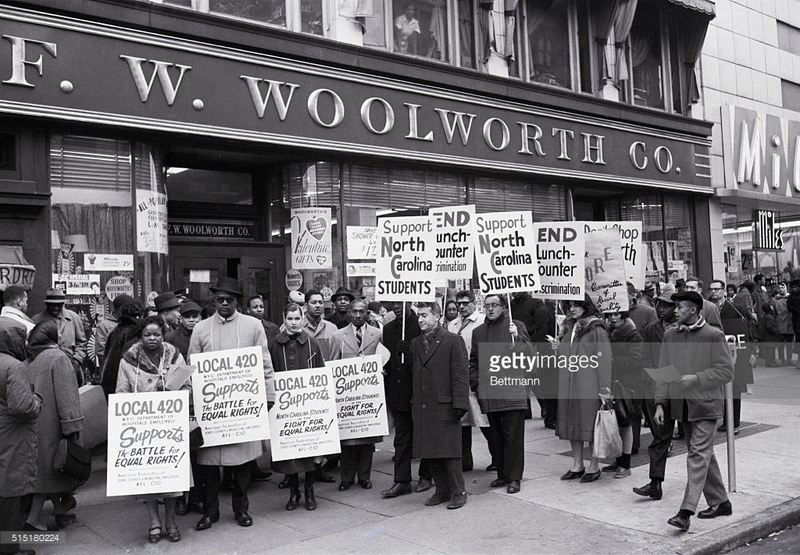 But that didn’t stop protesters from gathering at more than 100 Woolworths across the city to urge support for the North Carolina students and call for the end of the South’s Jim Crow laws. The New York–based Congress of Racial Equality “mounted a 30-member picket line in front of the F.W. Woolworth & Co. store at 208 West 125th Street,” (above) reported the New York Times on February 14. Picketers continued demonstrating through the spring. On April 3, while 100 people protested outside the store, 30 young adults held a sit-in at a Woolworth’s counter on 34th Street near Seventh Avenue. “Neither the store’s personnel nor the police tried to oust them. They soon dispersed.” More protests, like this one at a Woolworth’s in Times Square, followed. Officially, lunch counters in the South desegregated that summer. This entry was posted on July 28, 2016 at 6:38 am and is filed under Bars and restaurants, Midtown, Politics, Upper Manhattan. You can follow any responses to this entry through the RSS 2.0 feed. You can leave a response, or trackback from your own site. It’s nice to read about fine citizens standing up the hate and discrimination of the Democratic party. Fun fact: The Democratic party had the longest serving Klansman in history in office. Hillary even had high praise for Robert Byrd. Remember that the next time you pull a (D) lever. After the 1965 Civil Rights Act was passed into law, all the racists that were in the Democratic Party switched to the Republican, and that’s been their home ever since. Robert Byrd has reformed his stance in the 1970s and spent the last decades of his tenure in office making up for his old ways. Don’t play fast and loose with the facts. 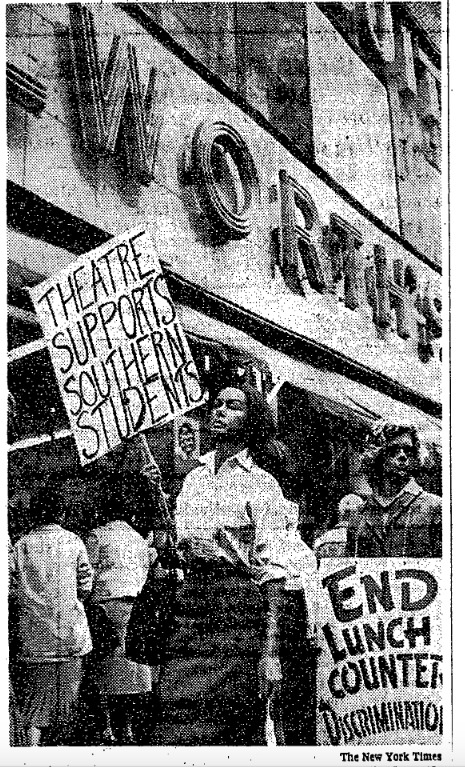 Besides, this article is about the protests at Woolworth’s to protest discrimination. Acts of peaceful marches and civil disobedience went a long way to help booster support for desegregation and allow for the Civil Rights Acts and the Voters Rights Act. True, but 1960 is the year the sit down protests gained momentum and captured the people’s attention nationwide.